You know what? It just doesn’t stop. After she got over pneumonia, Tomoe got sick again. This time, it’s bronchitis. Last week, the doctor gave her that diagnosis, and I thought he was pretty much correct. I’ve been through bronchitis 3 times, so I know what it’s like. The cough she had was horrible sounding. Well, it seems she got over it pretty quickly, then got sick again today. High fever all day after seeming pretty healthy for the first time in more than 2 months. I guess it was just too good to last. She doesn’t seem to be coughing much, but it’s mainly just a runny nose and sore throat. 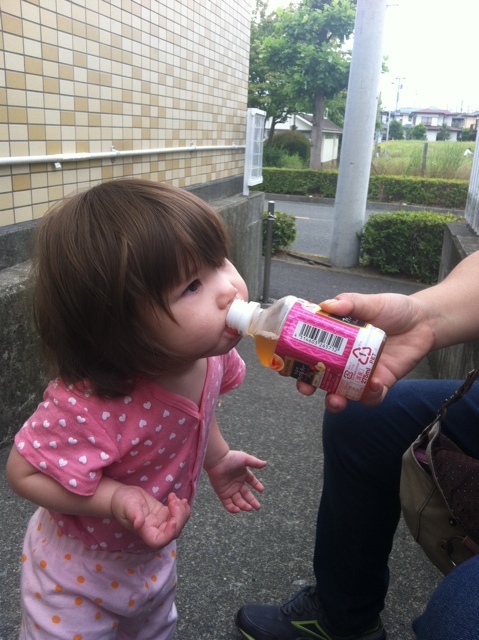 She seems to do okay with bottles like this, though cups are still difficult. She prefers a straw, though. Another thing she’s doing that isn’t making life easy is defiance. She’s trying to touch and grab everything she can, and when it’s something she shouldn’t have, we take it away and she talks back at us angrily. She’s not using words, but she sure is angry. She’s not at the age where she learns limits, though. She keeps trying and trying to do things she shouldn’t be doing. On the upside, she is attempting more words. Her “hello” is now “he-o” and her “bye-bye” is now “dye-dye.” Not bad. She learned “choudai” which is Japanese for “give” so she’s saying “Please give to me.” However, she often refuses to say it and cries instead. She’s also been very affectionate at times. One example is when I was getting ready to take her to the nursery yesterday, she climbed up on my lap and gave me a big hug. When we got to the nursery, she didn’t want to let go of me and started crying. She didn’t want me to leave. She understands she’s staying, though. Tomoe can do something my mom probably can’t do. She can turn on and unlock my iPhone. Sorry, mom. I’m joking! When people in Japan talk about improving their skills, they usually say “skill up.” Well, Tomoe has really skilled up a lot! Since her stay at the hospital, she’s shown us some big advances in ability. One of the first things she showed us is that she can now pretend. She used her fingers to pretend to pick up food and put it in her mouth. Then she pretended to chew. She does that often these days. She also picked up a small metal box and used her finger to press “buttons.” She put it to her ear and started talking. So, we got her a toy cell phone, and she enjoys holding it to her ear and talking all the time. She loves her phone. Hello! Who’s speaking? She’s holding her mom’s phone. 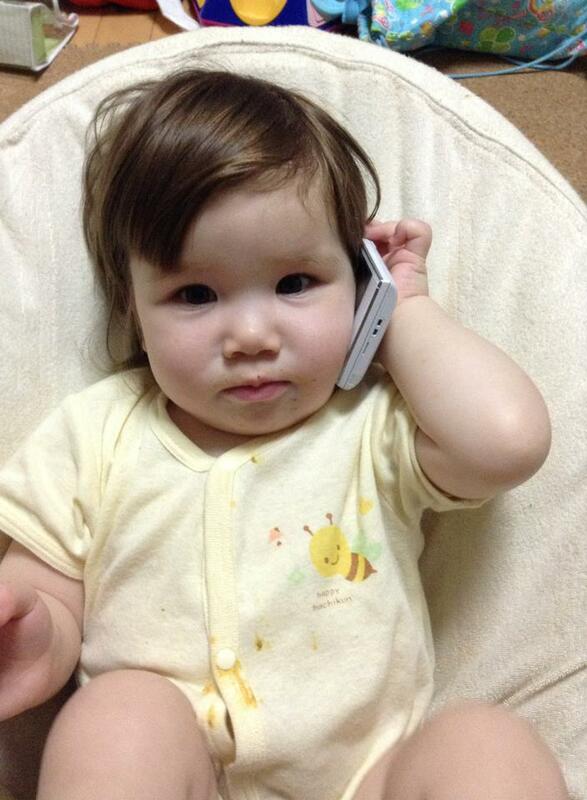 In addition, whenever she’s asked “Where’s moshi moshi?” she’ll find her phone. “Moshi moshi” is hello on the phone in Japanese. Some more useful skills include putting a bottle upright after knocking it down. She places it on the table very nicely. She’s also learning to let us know when she’s pooped. She’ll be rather irritable when she’s pooped. I think potty training may start soon! As far as communication goes, she’s more frequently saying “mama” and “dada.” She’s also shaking her head “no” when she doesn’t want something. She points all the time now at anything she wants us to look at. When she looks at books, she repeatedly points at pictures and I tell her what they are. She seems to enjoy that a lot. Mimicking is also a big skill she’s improving. She’s copying so many things, mostly actions, but occasionally sounds. And finally, this was a very big surprise. 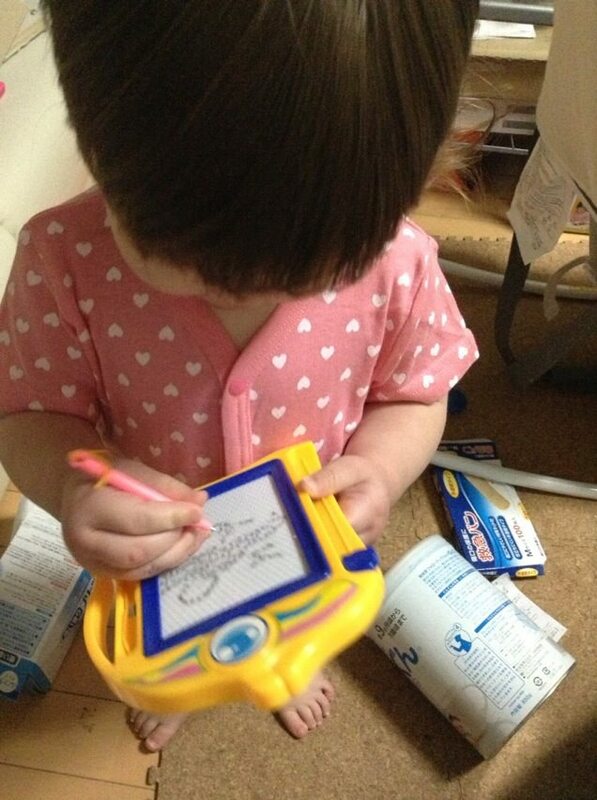 We got her a very cheap toy that’s like a tablet with iron filings and a pen with a magnet. Now she can learn to hold a pen. But she surprised us. She held the pen like a natural. It seems she has very good dexterity and fine control with her fingers. Look at how naturally she holds the pen. Now, on to some other news. Tomoe has still been sick. 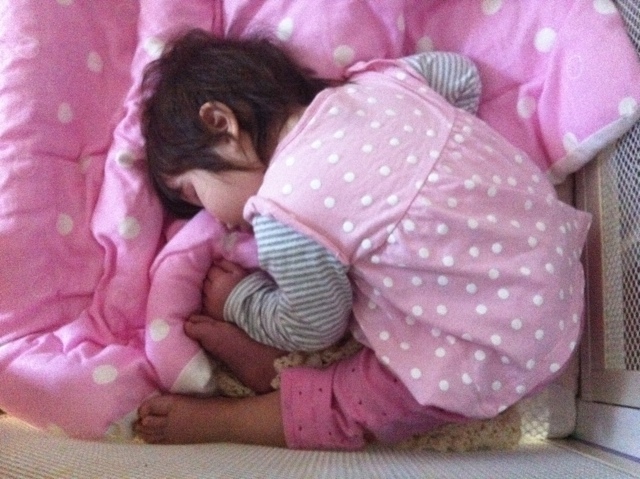 Last week, she had diarrhea one day with a very high fever. But when her diarrhea finished, her fever was gone. However, we found out this week that she has adenovirus. She can’t go to her regular nursery for a while. However, she has boundless energy. I don’t get it. She still gets diarrhea, though. Tomorrow morning, we’re going to pick up Tomoe from the hospital. She’s coming home! Lately, she’s been doing pretty good. She’s acting very normally and seems to be getting over her pneumonia. My wife is working tomorrow, so I get to spend the day with Tomoe. It’ll be great to see her back. During our visits with her, she started out being a little cranky, but as her stay got longer, she was laughing more with us. She was getting her happy personality back. But this also meant that when we left her, she started crying. On Monday, she cried so hard when we said good bye and left. It’s hard to do that! Well, no more. She’s home tomorrow! The last few days have been a blur. So much has happened. I should begin by saying that April had been one of the more difficult months for us, because Tomoe had caught a cold twice in the first half of the month, requiring us to take a lot of extra care of her. She’d been to the doctor several times, had to stay at home with a very expensive babysitter on the weekends, and stay at a clinic’s nursery on weekdays that she had a fever. Other times, she went to her regular nursery. Halfway through the month, she was finally healthy again. It was great to see her like that. But then, on April 26th, we went to Costco in a rental car, and this is where the saga begins. We’re not sure how she got sick, but after spending the day out shopping, Tomoe developed a fever. She’d spent some time in the car, unfortunately, part of it in the sun. We thought she was just overheated and dehydrated. But we kept her drinking. However, she felt better the next morning, though still had a slight fever. We were going to call a babysitter, but her temperature dropped, and she was fine to go to the nursery. It was too late for her to be picked up, so I had to take her myself. They called us shortly after I left her there to tell us that her temperature had gone up to 37.7 degrees. If it went above 38, we’d have to pick her up. However, it dropped back down to normal. That night, however, her temperature went back up. It was very high. We called my wife’s mom, and she agreed to come and take care of her for the day. So, on Sunday, when I finished work, my wife emailed me to meet them at Tsujido, because Tomoe had to be taken to the hospital. She then emailed me to ask me to go to the hospital ER, where I met my wife and her mother. The reason they went to the emergency room is because that’s the only place that’s open on a Sunday. They gave her medicine for her cold and fever, and we went out for dinner. Then we went home. Monday morning came, and her fever was a bit high. 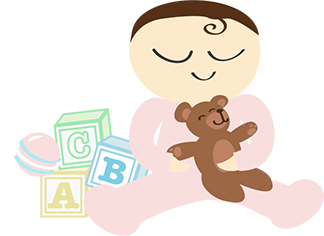 We cancelled her nursery, but since it was a holiday, both the clinic’s nursery and the babysitters were closed. We had a problem. However, her temperature went down, and she was fine to go to the nursery. So, before I went to work, I dropped her off. Around 3pm, my wife got a call to pick her up. She was near the end of her shift, so she could as soon as she finished work. Tomoe’s temperature was above 38 degrees. Tuesday is my wife’s day off, so there was no problem. She still had a fever, but seemed mostly okay. Then came Wednesday. We both had to work again, so I took her to the clinic’s nursery, where we got a diagnosis of an ear infection. 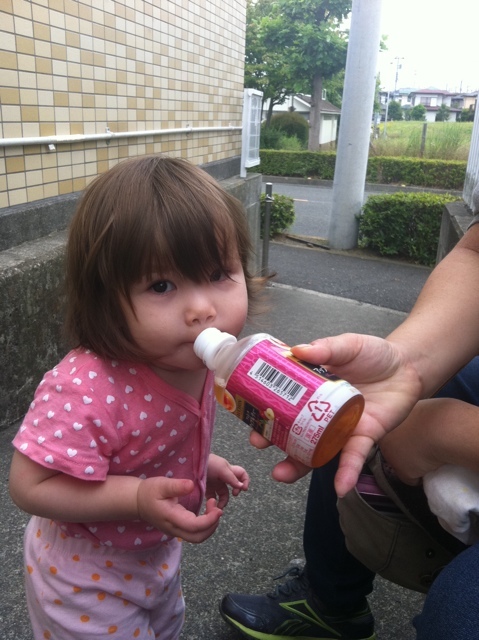 It’s Tomoe’s first ear infection, which is a kind of rite of passage for children, in a way. I used to have them regularly when I was a child, so I understand how it feels. Unfortunately, this was when I started feeling sick, too. Tomoe gave me her cold! I decided to cancel my lessons on Thursday (not my regular job, but an extra one), so I could take care of her for the day. It turned out to be the best decision I could make. Tomoe had a fever all day on Thursday. She was irritable, didn’t want to sit with me, and spent some time throwing things around. Not a happy camper. She ate a small breakfast, slept a long time in the afternoon, then had a full lunch. 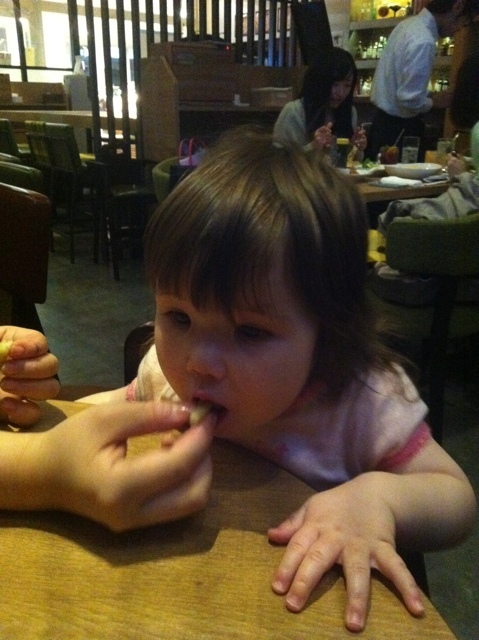 That was a good sign, because she usually doesn’t want to eat much while she has a high fever. I kept her hydrated throughout the day. Then I found that her temperature had gone up to 39.6 degrees. Very high! I fed her dinner, which she ate half of, and then tried to get her to sleep. She slept for a while, until my wife came home. That’s when all hell broke loose. While we were getting her fever medicine ready, she started convulsing. Her entire body was seizing. Her eyes were closed, she was drooling with her mouth foaming, and her arms and legs were jerking around rhythmically. This was the most frightening moment in my life. The 2011 Tohoku earthquake was nothing compared to this! 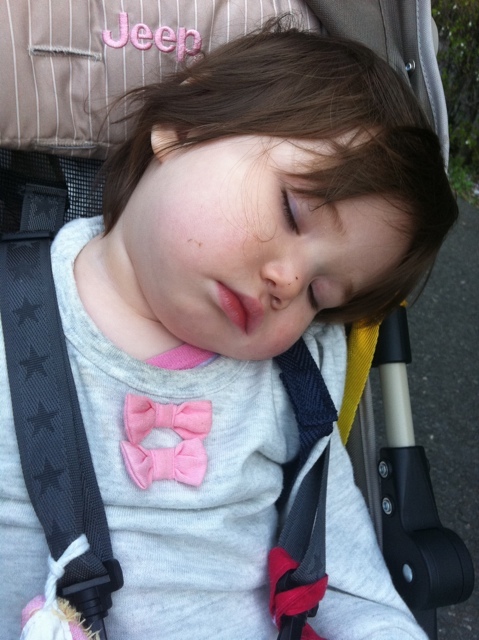 The seizure, which we discovered was a febrile seizure brought on by her fever, lasted around 2 to 3 minutes. Not life-threatening, but still scary. It seems this is very common, and is kind of like the brain resetting. When the seizure stopped, she wheezed a lot. She was not breathing smoothly, and her whole body was limp. We called a taxi to take us to the local ER. During this taxi ride, she began whining a bit. She was quietly crying, and every shift in position made her cry more. When we arrived at the ER, we discovered that they close at 11pm! It was after midnight at this time, so we called the taxi company again to take us home. The entire taxi ride, she was crying loudly, grabbing and holding on to anything she could. Her arms and legs were jerking around again, but this was different. She was in pain. Her earache must have been very intense at that time. We were going to try give her the fever medicine when we got home, but she refused to open her mouth. She wasn’t very aware of what was going on around her. In fact, as I held her, she was unresponsive to any visual or audio stimuli. She was behaving very strangely. I told my wife we needed to get an ambulance. Her behaviour was too strange. While we were waiting for the ambulance, she opened her eyes and stared up at the sky. She didn’t seem to notice anything, though. It was like she was in some kind of catatonic state. When the ambulance arrived, the paramedics asked a lot of questions, and we were on our way to the hospital. It was my first ride in an ambulance. At the hospital, she was still unresponsive. They took her into a room at the ER, and we told the doctor everything about the day. We then went out and waited. It was after 1 am at this time. We waited for about an hour, when they called us into the room. The doctor didn’t have a diagnosis, but he suspected meningitis, mainly because of her behaviour. But they’d have to do a CT scan first. So, we went back out and waited again. Then, another hour later, we were called in with some good news. Her brain was normal. Then the bad news. A chest X-ray revealed that she probably had pneumonia. They would also still have to do a spinal tap to check on her spinal fluids. Another hour of waiting, and it’s after 4 am. We spent the rest of that time in the room with Tomoe, who was awake and alert. She was seeing us and reacting to us, so she was fully aware. We checked her in to the hospital, and followed them up to the pediatrics floor. We waited as she was taken care of, and then they explained to us about her stay at the hospital. She would stay until about May 8th or 9th. Her prognosis was good, thankfully. We then went home, arrived at around 7 am yesterday morning, and finally went to sleep around 8 am. We woke up in the afternoon and went to see Tomoe at the hospital. We visited her for about 3 hours. She was awake, alert, though somewhat irritable. I did get her to smile and laugh, though. I was very glad she still had her sense of humour. We fed her dinner, as well. One thing that she kept doing was taking her vital monitor sensor off. Very difficult to keep it on. But the good news is, she’ll be fine in a few days. So, here are some pictures I’ve taken of Tomoe over the past 3 weeks. This should lighten up the mood. Sleepy when out for a walk. Wonderful sleeping position. And so pink! Ready to go out! She’s standing at the window looking outside. 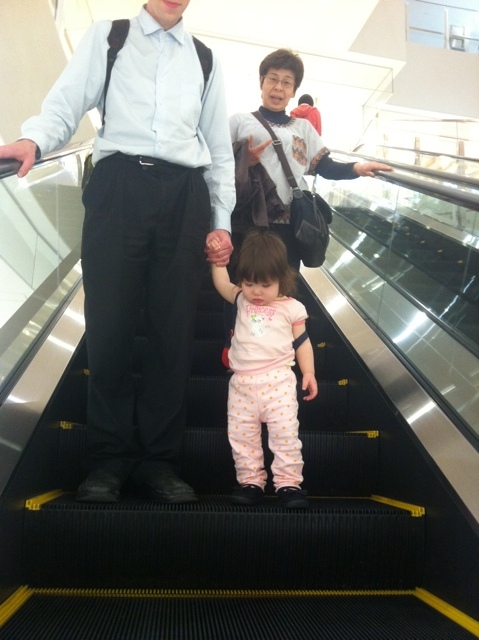 Escalator ride! This was on Sunday after her trip to the ER. Eating potatoes at the restaurant on Sunday. She loves potatoes. In other news, Tomoe’s been developing very well. She’s very generous! She loves giving things to people. She’ll pick something up and give it to us. Also, when she’s thirsty, she’ll pick up her drink straw bottle and give it to us. When it’s time to eat, she’ll get into her chair all by herself and sit patiently. She’s very good! She’s also figuring out a few more things. Yesterday, she showed us that she knows how lids go on dishes. She picked up a lid and tried to put it on the dish she was eating out of. On Sunday, she figured out how blocks go together, like Lego. She tried putting them together, but didn’t have them lined up properly. But she’s trying! Also, she knows how a key goes into a lock to unlock a door. She does it very well with one of her toys. Another thing she’s doing is pointing at things, especially when I tell her what they are. And finally, she’s started running, sort of. It won’t be long until she’s running normally.